Venezuelan citizens wait for a public transportation at a bus stop in Caracas, Venezuela, Jan. 3, 2018. A public transport employee who doesn't earn enough to feed himself, a doctor who watches his patients die for lack of medicines, a lawmaker without a legislature, three generations of one family emigrating — the list of victims of Venezuela's crisis is long. They come from all walks of life and dread the prospect of another six years under the man who has overseen it, President Nicolas Maduro. 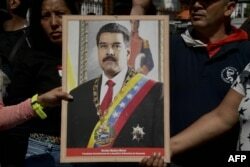 Supporters of Venezuelan President Nicolas Maduro hold a portrait of him in a ceremony to swear him in symbolically in front of the National Assembly building during a rally around the city in Caracas, Jan. 7, 2019. Nevertheless, the 56-year-old leader will be sworn in for a second six-year term on Thursday, after winning a presidential election in May dismissed as illegitimate by much of the international community on grounds that it was not free, fair or transparent. The opposition boycotted the vote, blaming Maduro for the political, economic and humanitarian crisis that has enveloped the oil-rich country. Jairo Colmenares scrapes by on the equivalent of seven dollars a month, which he earns as a Caracas metro worker. At the street market, it's barely enough to buy a dozen eggs, half a kilogram (a pound) of potatoes and a few pieces of fruit. On his days off, he says he gets up late to save himself a meal. "I've lost seven kilos," said Colmenares, a technician. 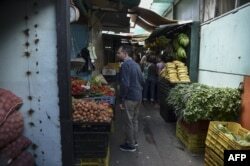 Jairo Colmenares a Venezuela's subway employee asks for prices of vegetables at the market in the west of Caracas, Dec. 29, 2018. Even with a little extra money he earns on the side, his diet mostly consists of beans or lentils that the government distributes at subsidized prices. "Once a month, we may buy chicken or meat," said Colmenares, 33. In 2017, he sent his children, aged 10 and 11, and their mother to neighboring Colombia, which has given refuge to around a million Venezuelans fleeing the crisis. For Colmenares — threatened with dismissal for trade union activities — Maduro is far from being the "worker president" he depicts himself to be because of his background as a bus driver. Water is scarce at the Miguel Perez Carreno hospital, the largest in Venezuela's capital. In a recent rush to the accident and emergency unit, family members brought their own water to swab the bloody face of a youth who had suffered a gunshot wound to the head. At the entrance of the 11-story building, a man waited forlornly on a stretcher, as a corpse under a sheet festered just a few meters (yards) away. 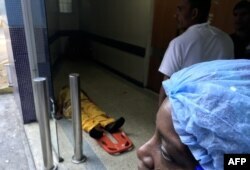 A man lies at the floor in the emergency area of Dr. Miguel Perez Carreno Hospital, in the west of Caracas, Venezuela, Dec. 31, 2018. "One or two patients die every day due to lack of supplies or while waiting for a surgical shift to come on," Jose, a 27-year-old neurosurgery resident, told AFP. 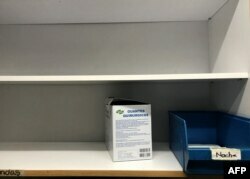 Empty storeroom shelves are evidence of the scarcity of medicines and basic hospital supplies, which trade unions estimate at 84 percent. Shortages of medicine and basic foods became the norm in Venezuela when oil prices collapsed, and Venezuela's crude production declined from 3.2 million barrels a day to 1.13 million bpd, crippling its ability to import necessary supplies. "When there are antibiotics, there are no syringes. And when there are syringes, there are no antibiotics. The planets must be aligned so that everything works as it should for a week," said Jose. A box of surgical gloves remains on the shelves of the pharmacy at the Dr. Miguel Perez Carreno Hospital, in the west of Caracas, Venezuela, Dec. 31, 2018. Water is scarce in 70 percent of Venezuela's hospitals, according to an NGO. "Usually there isn't any," added the doctor. The government blames the scarcities on an "economic war" and international sanctions, calculating losses at $20 billion in 2018. Maduro has been branded illegitimate by the opposition-dominated National Assembly, which has effectively been replaced by Maduro's own creation, the Constituent Assembly. The elected legislature can't make any decisions itself, after being declared in contempt by the Supreme Court, and lawmakers haven't been paid since 2016. "We have been handcuffed by the dictatorship," said opposition lawmaker Delsa Solorzano. Venezuelan opposition deputy Delsa Solorzano gestures as she speaks during an interview with AFP in Caracas, Jan. 2, 2019. Another lawmaker, Manuela Bolivar, says she is surviving through the remittances and products sent back by her husband and relatives who have emigrated abroad. "I have not seen a single cent of salary," said Bolivar, 35, who added that Maduro's ruling socialists "are seeking to break us." Provincial deputies tell of 14-hour bus journeys to be present at debates, because they can't afford the cost of flying, and eating just one meal a day. Henry Pena's elderly parents wept as they saw him off at a Caracas bus terminal. It's a common enough sight in Venezuela — 2.3 million people have fled the country since 2015. The U.N. expects the figure to surpass 5.3 million this year. The 45-year-old mechanic had returned from Peru, but only to collect his adult twin daughters and two grandchildren aged two and four. Three generations of one family were leaving — only the elderly great-grandparents stayed behind. People bid farewell to relatives before boarding a bus at a station in Caracas, Venezuela, Jan. 3, 2019. Pena sold his van, his motorbike and his television to pay for the tickets. The family took bread and juices for the long journey. "We made the decision to leave before Maduro closes the border or countries break off relations," said Pena. Fourteen hours later, they were through the border. "We're over the worst," said one of his daughters in a video message on her mobile phone, which showed a sign: "Welcome to Colombia."